Lloyd Beckett began curling in Kinley, Saskatchewan at a very young age and developed a passion for the sport that would last a lifetime. His mentor was his grandfather Jim Beckett, who played second for Bill Dunbar, a team from Kinley who won Provincial Men’s Championships in 1940 and 1941. 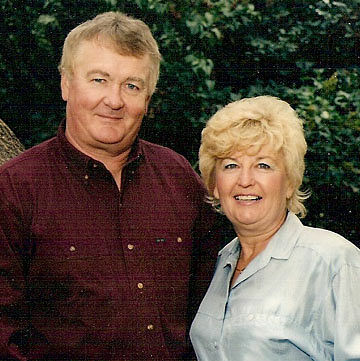 Lloyd introduced his future wife Bev to curling when she was 20. Bev says that in the winter time most of their dates were at the curling rink so she thought she might as well join in. They would both go on to have stellar curling careers. Bev curled in 7 Women’s Northern, two Senior Women’s Northerns, 4 provincial women’s and 2 Senior Women’s Provincials. In 1989 her team finished third at the Women’s Provincials. Bev also played lead on the Merle Kopach Team that won the Provincial Intermediate Women’s championship in 1992 and curled on teams that won the Saskatoon Super League in 1986, 1987 and 1991. Together they curled in 5 Provincial Mixed Championships winning the Province in 1985 with Lloyd skipping, Merle Kopach at third, Jim Walker playing second and Bev at lead. They curled in the Canadian Mixed Championship in Toronto and finished with a record of 6 and 5. Lloyd and Bev both were involved with coaching as well. Bev coached the Perdue High School Boys and Girls teams when their son Graydon was in High School. Lloyd coached the Dave Zultok Team that represented Saskatchewan at the 1987 Canada Winter Games in Cape Breton, Nova Scotia. Lloyd coached other competitive teams including the Sherry Anderson Team. Lloyd was also a level 4 Official and officiated at many Provincial and Canadian Championships including the Brier, Scott tournament of Hearts and also officiated at the 1988 Olympics in Calgary. Lloyd and Bev were also very active in their curling clubs. Whether it was Perdue, the Granite Curling or the Hub City Curling you could find them helping out where they could. Lloyd was on the Board of directors of the Hub City Curling Club and served as its President in 1985-86. He also served as Director of Facilities for the 1989 Brier in Saskatoon. In 1995 Lloyd and Bev retired from curling and started spending the winter months in warmer climates. Curling lost a great friend when Lloyd passed away on February 20, 2010.